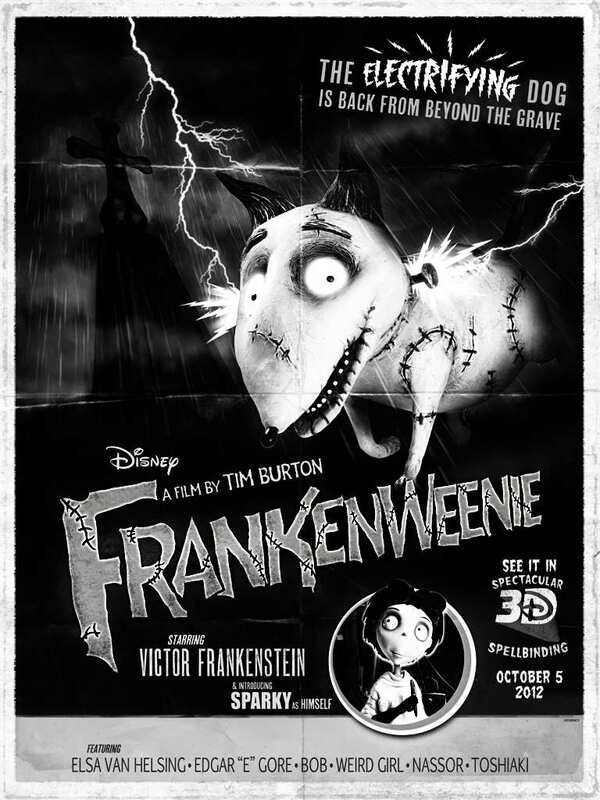 Tim Burton's FRANKENWEENIE is, despite its black and white mock horror gothic style, a warm-hearted and cuddly family feature, quite at home in the Disney stable. It transports the story of Frankenstein to that typically Burtonesque 50s style contemporary American suburbia, where little kids can be see the weird and cruel in the everyday. There are even characters that look and feel and sound like previous Burton characters - notably Winona Ryder voicing a little girl who could've become Lydia in BEETLEJUICE. Her male counterpart is Little Victor Frankenstein, a good-hearted loner so upset when his beloved pet dog Sparky dies, that he uses the town's preternatural lightning to re-animate him. Problem is, his creepy school-friends (all junior versions of well known horror tropes) find out about his scientific breakthrough and perform their own reanimations with gruesome and chaotic results. It took me a while to warm up to the characters - I spent the first twenty minutes more wrily smiling at the horror movie in-jokes and admiring the beautiful hand-made stop-motion animation. But soon Sparky and Victor stole my heart, and anyone's who's ever had a dog will appreciate the wonderful observation that went into capturing just how a pet dog acts. As the movie built to its dramatic Godzilla inspired climax, I became genuinely nervous about Sparky's fate! I can confidently say that if you go and see this movie with an open heart, whether or not with kids, you'll have a good time. But this film is far more interesting than "just" a superior kids film - not that there's anything wrong with that. Because FRANKENWEENIE is an absolutely darling film full of affection for the power and history of cinema, and simple delight of making things. It opens with a film within a film - little Victor showing his parents his home made super eight starring Sparky as the Sparkosaurus. The celluloid burns, but Victor's unpeturbed -"I can fix it!" he declares. So much of the mood and spirit of the movie is set by that phrase. It's a film about the wonder of film - the crazy illusions that we build with props and costumes and trick-shots - the almost juvenile glee that lurks behind even the most accomplished film. Of course, director Tim Burton is making a more profound statement about the nature of good film-making. He's saying that it's better to make a film with love and sticky-tape, then with crass showmanship in mind. Science and celluloid can be used for good or ill - it needs to come from the heart. Burton also makes a subversive political comment about the contemporary American anti-intellectual strain within the religious right. The poor scientist is evidently a European emmigre, who knows what horror he has seen. He finds himself attacked by a mob of suburban parents angry at "science". This leads to the funniest and most profound scene where he angrily calls them ignorant and stupid: "they like the things science gives them but fear the questions that it asks". Maybe I'm being too earnest about the political metatext of FRANKENWEENIE? But I don't think you need to scratch too hard on the surface of the seemingly Spielbergian family adventure to get to its more scabrous heart. And it's that doubling, that wonderful enchantment coupled with deeper provocation, that makes this by far Tim Burton's best film in year - maybe since EDWARD SCISSORHANDS. FRANKENWEENIE played Fantastic Fest and is currently on release in Canada, Colombia, Paraguay, Romania and the USA. It opens this week in Russia and Spain and next week in Belgium, Ireland, the UK, Hong Kong, the Netherlands, New Zealand, Portugal, Thailand, Ukraine and Iceland. It opens on October 25th in Australia, Chile, Malaysia and Switzerland and on October 31st in France. It opens on November 2nd in Brazil; on November 22nd in Argentina, Greece and Lithuania; on November 29th in Singapore; on December 15th in Japan; on December 28th in Turkey; on January 3rd 2013 in the Czech Republic and Hungary; on Jnauary 11th in Sweden; on January 17th in Denmark, Italy and Norway; and on January 24th in Germany.